Lots of people will instruct you in the art of panelizing a PCB using a design tool but Australia’s Dave Jones (not really a doctor) first explains the engineering economics behind the “why?” and then proceeds to show you how. Isn’t that the way you really want to learn these things? 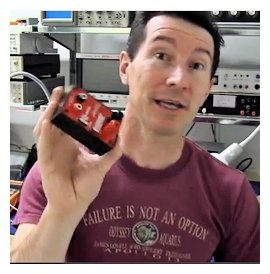 In this one-hour video, Jones walks you through the rationale for re-laying out the small PCB for his “Micro Current” product, an instrument accessory that he designed a few years ago that he needs to take from hand assembly into volume production because it immediately sells out every time he makes a small batch of 50 and lists availability on his Web site—www.EEVBlog.com. So Jones decided to panelize the PCB, 10 up on a panel, to optimize the design for limited mass production on a pick-and-place machine. It’s a typical problem for a small company (or a big one, for that matter) faced with a production ramp up. This video is an hour long. Think that’s a long time to watch such a video? Well, first of all, it would take you months of experimentation to discover the tricks Jones drops along the way. Like what? Like when should you use a routed edge and when should you use a v-groove as de-panelization aids. I’ll bet you haven’t heard Jones’ explanation. And then there’s Jone’s presentation style. This guy is one of a kind. This entry was posted in EDA360, pcb, System Realization and tagged Australia, Dave Jones, panelization, pcb. Bookmark the permalink.